This week’s secret ingredient is Spring Onions. Spring onions are one of my favorites probably because I’m so excited things are growing and being harvested in the northeast. Onions have their place in so many recipes. They contain fiber, folate, potassium as well as the flavonoid quercetin. This is an important phytonutrient that helps eliminate free radicals that can contribute to aging process, cancer, heart disease and eye degeneration. I’ve read that the quercetin absorbed from onions will stay in the body 24 hours. What a great way to build up those antioxidants! I love to buy my spring onions at the farmers markets but the local grocery stores usually carry them too. You’ll want crisp color and texture with nice long stems. You should be able to find them in green or purple and both are delicious. I like to keep my spring onions in the refrigerator, away from other fruits and vegetables, until I’m ready to use which should be within the week. The closer you can eat your food from the time it was harvested the better it will taste. If you’re looking for a really strong spring onion, look for ramps. These are often hard to find but if you ever get the chance, grab some. 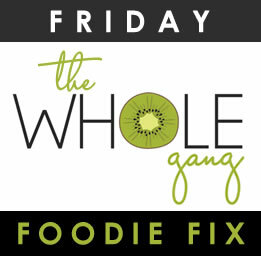 Next Week’s Secret Ingredient for Friday Foodie Fix is … Blueberries! Now it’s your turn to share your gluten free recipes with spring onions below. Hi Diane! Thank you so much for featuring my recipe this week! I love your secret ingredient link up [arty! Thanks so much for hosting! This week, I shared my Broccoli Pesto Sammie Stackers! They're gluten free, Body Ecology Diet friendly with a Vegan option! Thanks again! Have a great weekend! Who they sound great. I love recipes with options. Thank you for sharing. Hi Diane – I am submitting a beet quinoa salad recipe I made with spring onions but, because they are not year-round, I also included scallions as an alternative (the cheese recipe linked within it is scallion-based, but I have also made it with great success using spring onions). Have a great weekend! Valerie thank you for sharing. What a great combo with beets. We love beets and what great things they do for a body. i am a little late, but I am here! I will share on fb/twitter too! sneaking in one more recipe before the weekend is over! i'm sharing my Potato Gallete with Roasted Red Pepper Cashew "Cream" Sauce! It's gluten free, vegan, and body ecology diet friendly! thanks again for hosting! Oh that sounds devine. I love cashew cream. I find it totally addicting. This looks like something fun to try with the family. Thank you for sharing Heather. I do love cashews! This week I am sharing my SCD, Vegan, and Grain Free Lasagna! It contains some delicious sweet browned, sauteed onions. Amber I'm so glad you shared this dish. I've wanted to make something similar with the cashew cream cheese but wasn't sure how it would fare with baking it. So glad you figured that one out! Thank you for sharing.